And what about population? 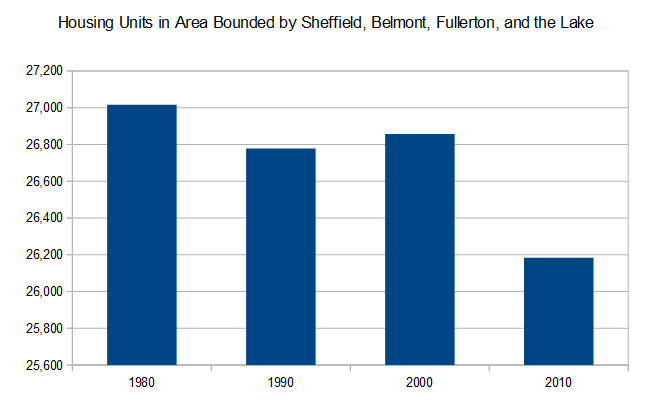 Is the neighborhood pushing towards unprecedented density? In conclusion, the idea that building 128 housing units on Diversey would be pushing the envelope into uncharted territories of congestion is simply a lie. In fact, the area was notably denser within very recent memory. And, of course, in the interim, the demand to live in this area has skyrocketed; median income family income is now well over $100,000 a year, or more than twice – and pushing three times – the metropolitan area average. Housing costs are correspondingly high. And Chicago’s housing policy has led to a situation in which fewer people are allowed to live there. Dear alderman, who have the power to approve this and other housing projects (and, while we’re at it, a rational inclusionary zoning ordinance): fix it, please. * Why did it decline? The longer answer is you should read this. But the basic story is that Chicago has laws that prohibit buildings over a certain density all over town; in fact, they generally prohibit anything denser than what’s already there. As a result, when buildings get redeveloped, they’re usually either built at the same density as before – a two-flat replaced by a two-flat, for example – or at a lower density – a two-flat replaced by a mansion. That makes the total number of housing units fall, which also makes population fall. On top of that, over time people have been taking up more space – instead of a five-person family in a two-bedroom, you get a three-person family, or a childless couple – and so population often declines even if the number of units hasn’t. To make up for that space issue, the city would have to let people build more. But it doesn’t. Previous Previous post: Where did Chicago’s population decline? Cheryl is concerned about traffic, not population density per se. Couldn’t you spin this into a discussion not just about density, but also how public transportation accessibility (i.e. BRT) should go hand-in-hand with allowing greater density? Yes, I could. And should. Especially given that the North Main trunk (Red, Brown, Purple lines) is near capacity, adding transit – maybe, say, a bus-only lane on LSD, plus BRT on Ashland – should be a priority. When the population shifts from multiple children to fewer but better off adults the car ownership/usage goes up, and, surprise, CTA cuts service because there isn’t money to run the previous services. As to Daniel’s comment on the L being at capacity, 50 years ago the trains ran faster and closer together providing more total seats per hour. With lower car ownership the buses made better time. The trains ran faster; I’m not sure if they ran closer together. Red Line rush hour is now at ~3 minutes – were headways really less than that in the 1950s? This is great! I only wish I had these numbers when I served on a neighborhood association in Lincoln Park. 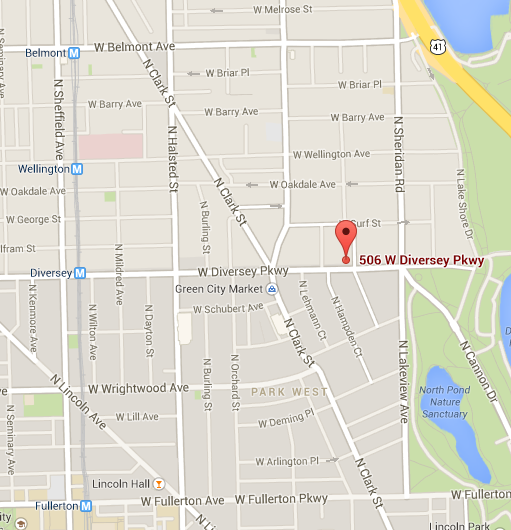 The amount of misinformation and NIMBYism, especially in the Lincoln Park and Lakeview neighborhoods, is astounding. Where does that stat come from? Median *family* income in the Chicago Metro is over $70k. LP’s median family income (which i can’t find quickly) is not pushing $200k. Median *household* income is $51k, for the metro, and for the LP community area it’s around $90k. If you are comparing the family income median of LP to the household income median (or average) for the metro (or the city, or another community area), you’re comparing apples and oranges. Yeah, sorry, you’re right that it should have been median household income. 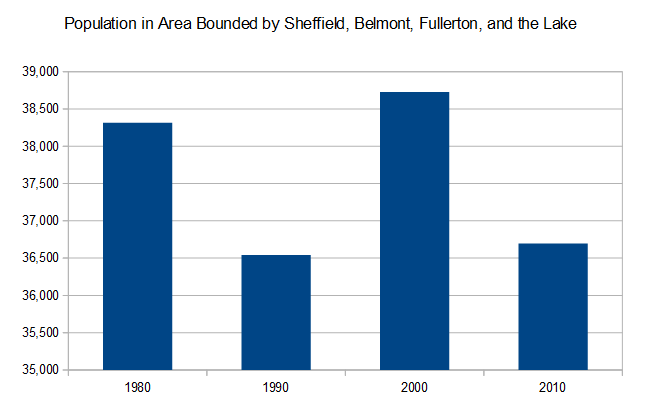 The areas I was referring to I showed in the map – they’re bounded by Fullerton, Belmont, and Sheffield. Within those areas, there are a number of Census tracts where median household income is definitely two to three times the metro area’s median – well over $100,000 and pushing $200,000 in some cases.